Most of our recent runs have started at one of the trailheads on NW 53rd, which is convenient since it is close to my house and cuts down on travel time and gives us more time to run. This week I decided to start our route from the Springville trailhead, to give us a change of scenery. Right off the bat we took a wrong turn going down Springville instead of Firelane 7, once we hit Wildwood we decided to head to Firelane 7A and readjust the route at the end. We headed down 7A to Leif, but it wasn't obvious where 7A continued on the other side of Leif. We ran back and forth on Leif looking for the trail and finally decided to head down what appeared to be an overgrown trail without a trail sign. The trail ran parallel with wire gate for while, making us feel like we were in the tv show Lost. 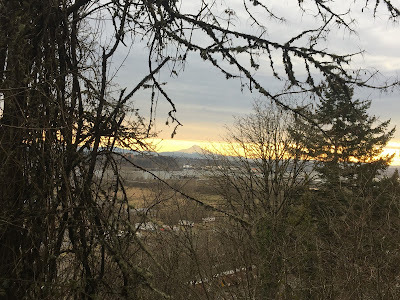 We got some good views of Portland and Mt. Hood, it wasn't until we made it to the end of the trail that we knew we were on the right trail, only because there was a trail sign. 2016 was a good year, but it wasn't a great year. 2016 was the year of readjustments, I spent a good part of the year dealing with a knee issue, a herniated disc and an iron deficiency, Susan dealt with knee and achilles issues. We were an hour slower at the Oregon Coast 50k, Peterson Ridge 40m and Wildwood end to end. Despite all the set backs we still had a pretty eventful year. We crewed our first race at Bandera, we traveled to France to run CCC and experience all that is UTMB. Every race we ran this year we had family who traveled with us and sometimes crewed for us, which made the experiences even more special. I learned a lot about recovering from an injury and that taking a break is ok. Susan and I both want to be running trails many years from now, I think this year taught us a lot about what we need to do to accomplish this. One thing we didn't do much of in 2016 was self supported runs outside of Forest Park; this is our 2017 running resolution. It's our yearly tradition to run Wildwood from one and to another during the Thanksgiving holiday weekend, which is usually in between our birthdays. This year, however, the weather was awful and we just weren't feeling it... so we postponed til the next weekend. When the next weekend came around, Ann had just got back from a conference in Las Vegas, and we postponed again. Then there was snow, twice, then Ann was in Michigan, then it was Christmas... and finally, we had a day when everything aligned.